The Hershey/Harrisburg area is a world-class destination for conventions and groups of all sizes. At Premiere #1 Limousine, we can help make your event the perfect affair you want it to be. Let us take care of all the logistics of picking groups up at the airport, taking them to their hotels, and taking them out on the town — all in our spotless limousines, sedans, vans and mini-buses. You’ll not only set the right tone of elegance and exclusivity, but you’ll give your guests a stress-free way to enjoy one of the most dynamic cities in the world. 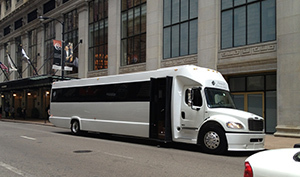 Why Choose a Chauffeur Limo Service for Group Transportation to Your Convention? If you’ve got a group heading to a convention, chauffeur limo service is a great way to start it off right. There are a number of reasons why chauffeur limo service for your group can be the ideal choice. When you travel with your group together in luxury, the party, networking or business groundwork can start right away, giving you a jump on the rest of the conventioneers. Similarly, after the event is over, a relaxing limousine car ride can give you a great opportunity to do a little postmortem with your fellow conventioneers. Chauffeur limo service also helps you make sure all members of your group are accounted for. Trying to coordinate meeting with your group when everyone is coming from different directions and are responsible for their own travel arrangements can be a real hassle. If you’re all leaving for and coming back from the event in the same luxury limousine car, however, you don’t have to worry about where stragglers to your group might have gotten off to, or whether or not they made it to the event at all. A Premiere #1 Limousine Service ride can make the trip to and from the convention as memorable as the convention itself. Per your instructions, our driver can take the scenic route so you and your guests can take in the sights and sounds of the city on the way to the convention. When it’s all over, our skilled chauffeurs can take group members back to their individual hotels, out for a night on the town or both. A convention is supposed to be a unique, memorable experience. Make it that much more so with Premiere #1 Limousine Service for your group for your next convention in or around central Pennsylvania. If you’re attending a convention in Harrisburg or elsewhere in the central Pennsylvania area, Premiere #1 Limousine Service has you covered. It doesn’t matter how big your group is — we have everything from a three-passenger sedan to a stretch limo to a minibus to a motor coach to accommodate you and your group. All our quality luxury vehicles will be driven by a highly professional driver who knows where you’re going, how to get you there safely and in style. If you’ve got a convention coming up in the central Pennsylvania area, let us get you there the right way, with a chauffeur limo service to your event that you and your group will never forget. Our online registration and virtually instant reservation conformation makes the whole process easy and stress-free. Fill out and submit the form below for a quote, to find out more about our services or to make a reservation.